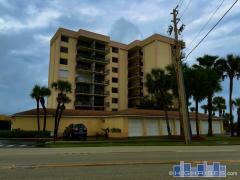 Harbor Pointe is a large condominium complex located on the Indian River in Titusville, FL. Harbor Pointe has four 12-story high-rises and one 5-story mid-rise. Amenities at Harbor Pointe include a swimming pool and spa, a resident clubroom, sauna, fitness center and more. Have any comments or questions about Harbor Pointe? Ask your question and/or share your thoughts about this Building. Interested in purchasing a condo.